I graduated from Glasgow School of Art in 1983 with a B.A.hons in Fine Art and Design, specialising in stained glass. In 1984 I was employed as the stained glass conservator for the Burrell Collection in Glasgow. With over 700 panels of Romanesque, Gothic and Renaissance glass from all over Europe, it is one of the largest collections of medieval stained glass in the world. I worked at the Burrell for eight years, during which time I not only conserved the glass, under the guidance of senior conservators, scientists and art historians, but I also researched the glass, travelling widely throughout Britain, Europe and America. Visiting scholars and conservators greatly contributed to my understanding of medieval glass, both in terms of art historical reference and technical expertise. During my last year at the Burrell I wrote "Stained Glass in the Burrell Collection", a guide to the stained glass on display, an insight into Sir William Burrell's taste in stained glass, and a history of the techniques used in the collection. It is this last area of research that I find the most fascinating - "how were the windows made?" and "how can I reproduce these techniques today?" For over thirty years I have been engaged in the examination of historic stained glass, and in assessing why some windows fail while others survive intact for hundreds of years. What I learn from studying historic glass directly informs my new work. My own work is inspired from what I see all around me, from nature, from architecture, from previously restored windows. As a fine artist I have a full working knowledge of the different historical styles and art movements, and can dip in and out of these styles with ease. I treat each new commission and client with regard for their individual requirements. Since 1984 I have been involved with various professional stained glass organisations. 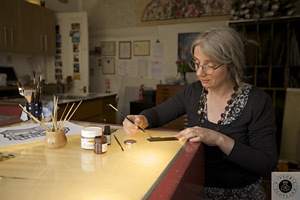 I am an Associate of the British Society of Master Glass Painters. For six years (1988-94) I served on the Conservation Committee of the BSMGP, as Secretary and Accreditation Co-ordinator. During this time I was also involved internationally with the Corpus Vitrearum Medii Aevi (CVMA). In 2000 I became an Accredited Conservator with the Institute of Conservation (Icon). I have served as secretary of the Icon stained glass section and as a member of the Icon-PACR committee from 2003 - 2010. I am married to Graeme Cannon, and we have two children. We live and work in Glasgow.